That was ridiculously good! What an amazing bundle of talent you are. I looked for your “Crying” on Amazon and iTunes but did not find it. I hope you release it soon! 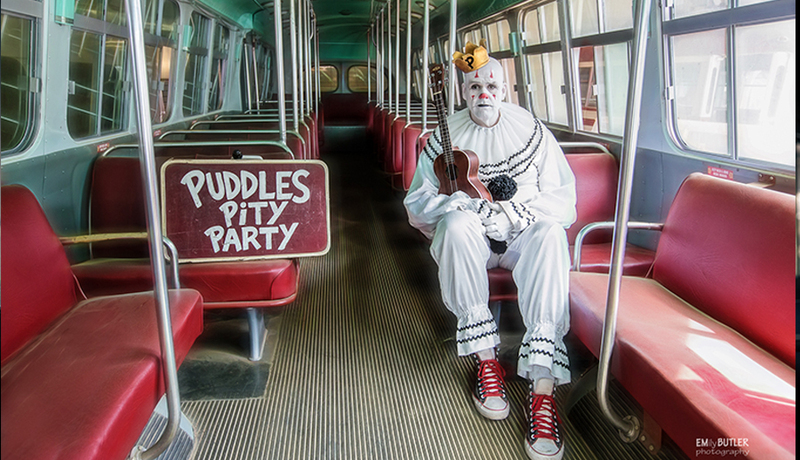 I love me some Puddles…Yes it is a sad dark world for a 7 ft Clown that does not speak…but sings with the voice of an Angel. Beautifully done. Like a song bird flew into my dreary prison. Causing me to momentarily believe in the Beauty of it all once again. I’m a sucker for a Baritone. (I’m one myself, according to the Sweet Adelines.) This is one of my favorite versions — you and Don Mclean. Have you considerd Wicked Game? You’re amazing. What Malachi said, Wicked Game! Consider covering Kate Bush’s Wuthering Heights. Love this, please do “Suspicious Minds” next! I so want to see you badly! My friend, Mugtoe, opened me up to your music and I have been in love ever since. Please, make a trip somewhere close to Junction City, Kansas. I know this is somewhere in the middle of BFE, but I hope to catch you soon. If you cover anything, hit up Dream Academy – Life in A Northern Town. BIG FAN! You accomplished the impossible. Nobody has owned that song as their own except Roy and now you.